Backyard Greenhouses is pleased to announced our best sale ever! 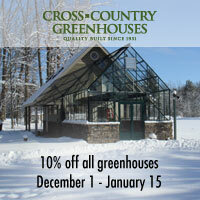 This winter, you can save a 10% discount off a greenhouse purchased between December 1, 2010 and January 15, 2011! The 10% discount applies to the regular price of the greenhouse and not to any sale prices listed, except in the case of our Most Popular Greenhouse Models. This limited time offer does not apply to the Legacy or Sun Garden greenhouse models. All greenhouses must be shipped out by |February 28, 2011. We cannot delay production of a greenhouse for shipping purposes, and greenhouses cannot be stored for any reason. From all of us at Backyard Greenhouses, we wish you and your family a safe and happy holiday season!